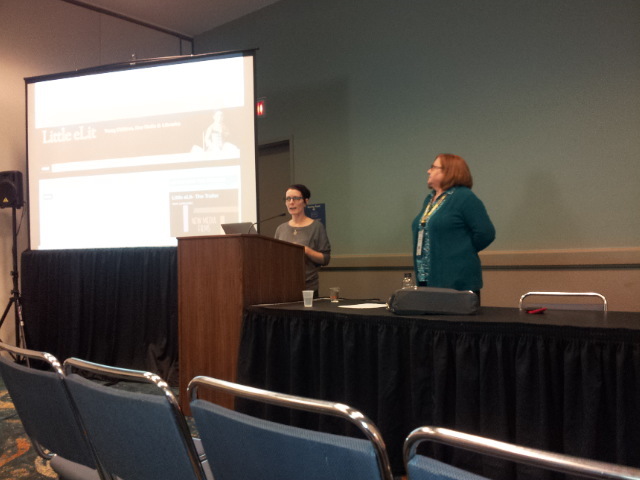 Last week Karen Nemeth and I presented Links with Libraries: The Surprisingly Diverse Ways Libraries are Supporting School Readiness at the National Head Start Association conference in Long Beach, California. Our session was sponsored by Follett Early Learning (Thanks, Andrew!) Our slides are below, as well as some photos. This was the first presentation I did when there was an interpreter present. He was really animated and I had to work really hard not to be distracted by his enthusiastic hand waving as he translated what we were saying into his little mouthpiece. Me, the prolific Karen Nemeth & our enthusiastic translator. Posted on May 6, 2014, in Literacy. Bookmark the permalink. Leave a comment.